"A six track album of carefully ironed creases, which rather than finding the listener laying back and drifting off to sleep on a warm sunny afternoon finds them seeking out the white flares, sparkly belt and linen shirt to flow with the funk dips of the retrospective ’70s disco afterparty." "'Something Can't Be Nothing' serves as the first single from the bands 5-song self titled EP. At the start of 'Something Can't Be Nothing', dreamy synth-pop guitar riffs fill the air. Soon after follows an equally as dreamy voice that we never want to end. The song has an excellent upbeat, get on your feet and dance vibe! There's only a few songs out there that can make our hips move without our control and this is one of them. Malibu Soma kind of sounds like a mix between Tame Impala, meets Capital Cities and The 1975. You'll be instantly hooked and wanting more, listening to only one song from the 5-song EP would be a total tease. We listened through the entire EP and truly feel that there's a story to be told here. From song #1 to song #5, prepare to get completely lost for a moment, enjoying the unique and delicious sounds of synth-pop ballads. Definitely one of our top picks!" "Do you like Stevie Wonder? Good! And what about Daft Punk? Like it too? Great! Nile Rodgers? You have to like him too, right? Perfect! Tame Impala? Alright, just keep on reading. Imagine a band, mixing this 3 ingredients plus the magnificent feature of making you realize how easily it would be to mix their songs with their influences tracks, but... You'll still recognize their own sound emerged from getting the best of what they love making it into an original pleasing piece of music. Malibu Soma is the band who made all this real. Nice groove, smooth mix of vocals, precious guitar riffs and solid rhythm through the whole album. As a Synth non-lover I must say they actually make a really good use of the instrument and sounds amazing in the whole mix." 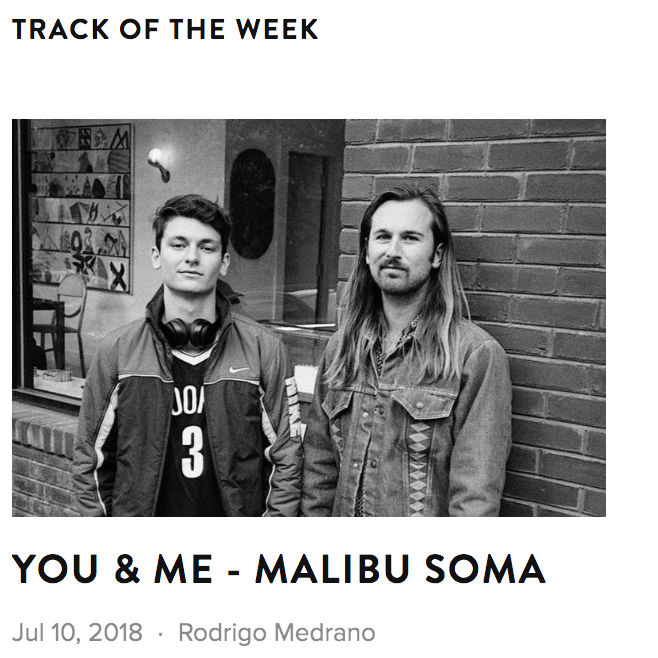 Press Release: Malibu Soma is a Los Angeles based Disco Indie rock band made up of long time friends Riley Donahue, Drew Thomsen, and Nathan Puckett. Their unique music, which spans across several genres, mostly featuring synth-heavy melodic tunes that you'll enjoy by the pool. They combine dance-able four-on-the-floor beats to catchy melodies and soaring instrumental sections that are ideal for summer nights spent dancing with a drink in your hand.